When walking inside a bathroom, one of the things that usually catch our attention is the bathroom accessories. They are useful, attractive and a necessity, especially in hotels, spas or even in luxurious houses where every detail and style is exquisitely planned. They are also centered on the design and theme of the bathroom interior to add balance and elegance. 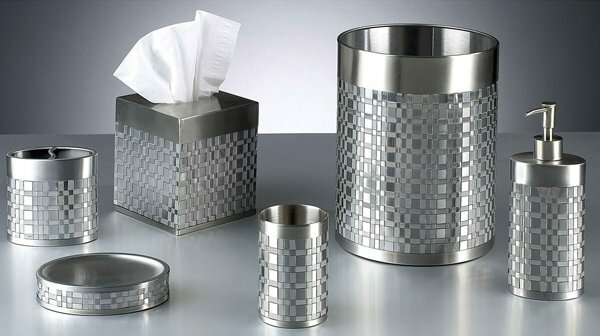 Well, luxurious bathroom accessories too give not just attraction but also sophistication to the interior design. A sign of a beautifully decorated bathroom is how it is accented by the bath accessories and the theme. 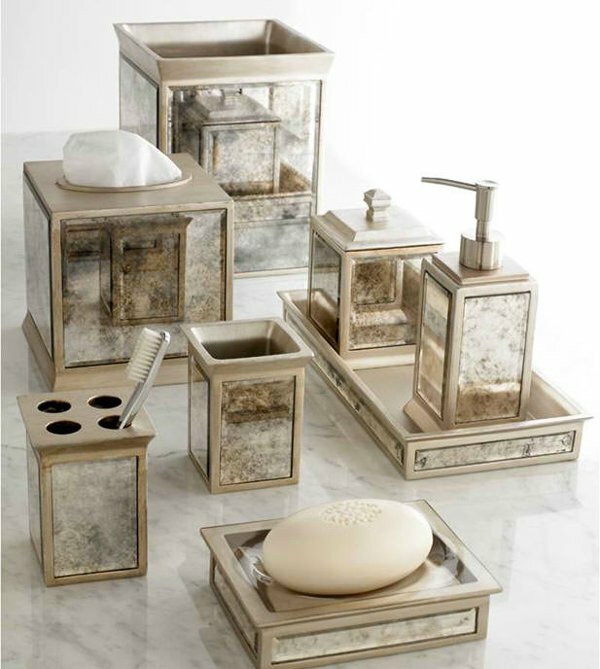 For this post, we are featuring 15 Luxury Bathroom Accessory for Inspiration. 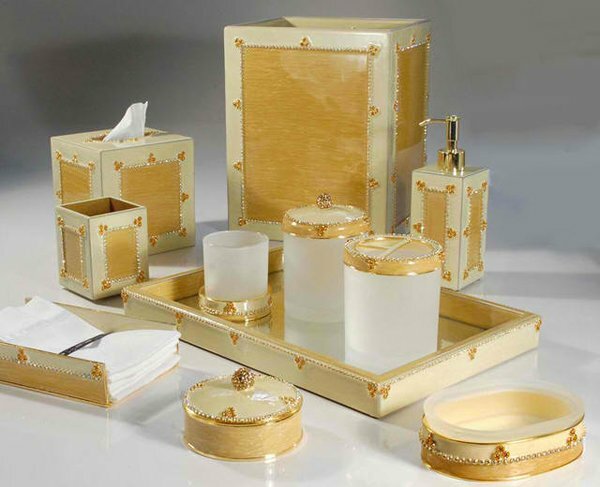 These bathroom ensembles are made from luxurious materials and are highly exquisite. They add a certain level of attraction that would never be denied in walking into a bathroom interior. They are made from unique and beautifully crafted materials for glamour and undeniable elegance. 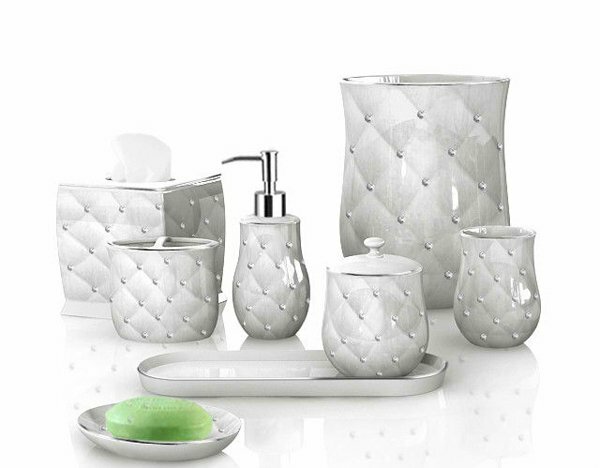 This bathroom set is luxurious on its own way since it is decorated with rhinestones set in diamond patterns for added glamour and simple elegance. Chic, modern and retro, this bathroom accessory sure is attractive and would add glamour to any bathroom interior. This modern bathroom accessory is elegant with interesting glass mosaic accents that create sparkling and eye- catching effects. Another glamorous bathroom accessory with hand-painted motifs that adds charm to this metal tole bath set crafted from brass, truly luxurious isn’t it? 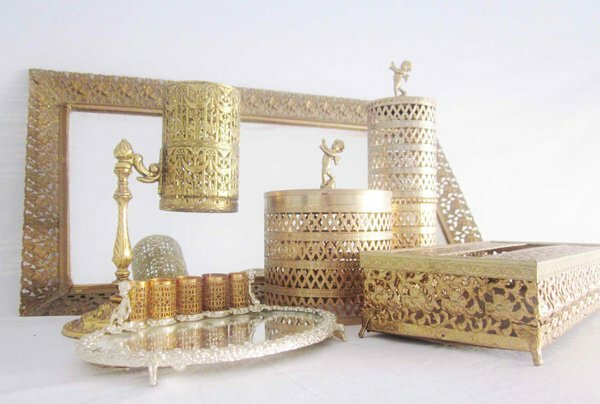 This traditional bath accessory is made glamorous by its intricate design and gold shadow finish and will surely add luxury to a bathroom interior. This vintage mid-century vanity set is glamorous and has an air of simple elegance, with its brass gold finish and intricate design. This will surely add glamour to any bathroom. 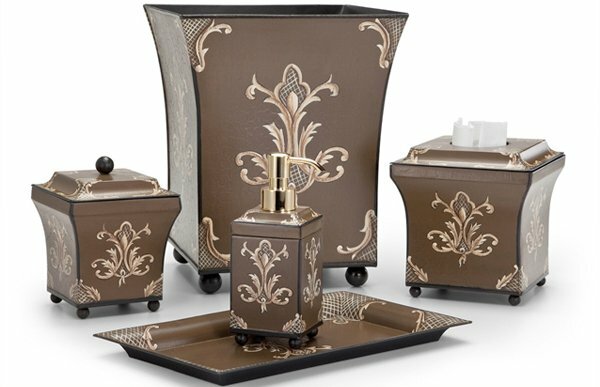 Another captivating and luxurious bathroom accessory set that adds elegance and attraction to a bathroom interior with carefully crafted capiz shells exterior design. 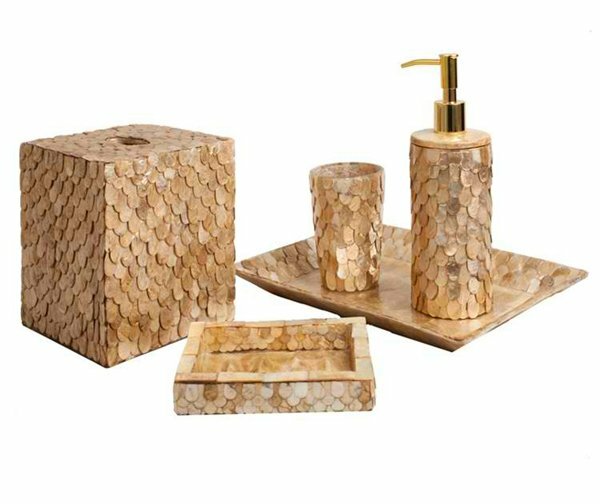 A bathroom accessory set that is in rich gold color that is very sophisticated and chick, the exterior is made of layering cut golden capiz shells responsible for this beautiful effect. 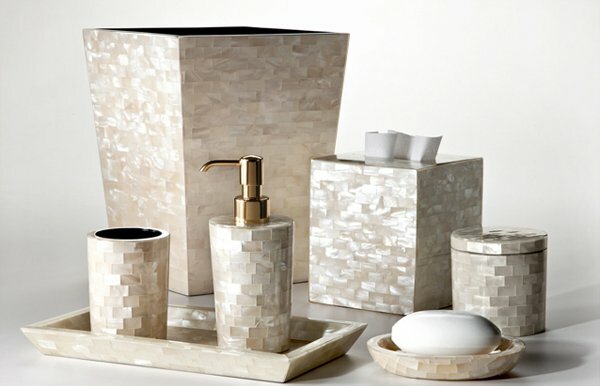 This elegant bathroom accessory is made from rare shells known as “White Agate” Mother of Pearl that is hand-crafted form the Philippines, which would sure add luxurious elegance to any bathroom interior. 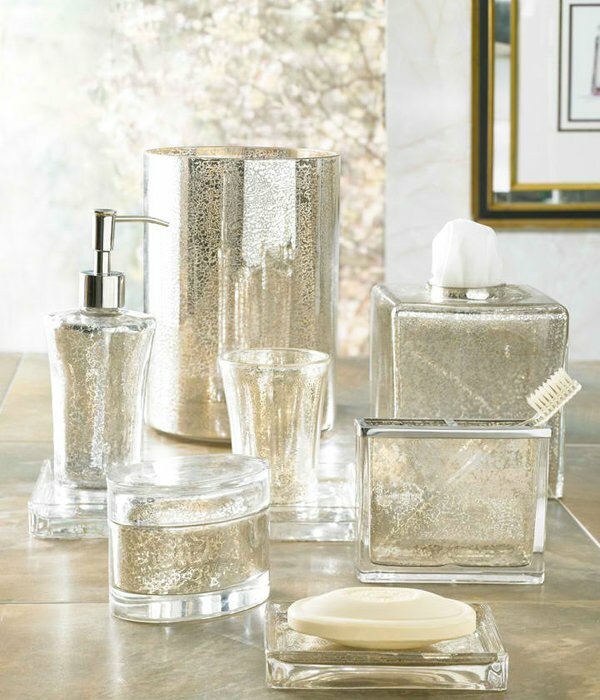 A unique bathroom accessory that is sleek, simple and elegant made from glass with shimmering gold finish. The simple elegance wouldn’t over-whelm a bathroom interior, but it is still very attractive. 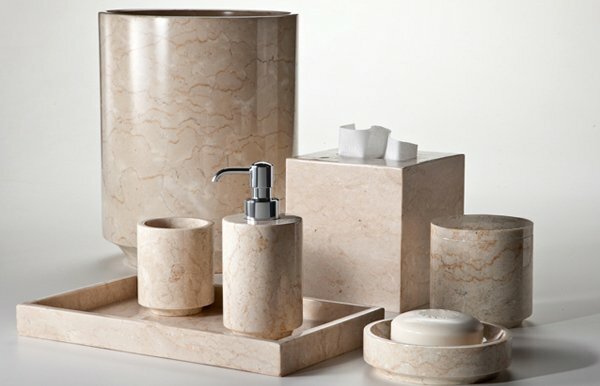 Another simple and elegant bathroom accessory set that is made from naturally crafted smooth solid natural alabaster stone that comes in clean cream color that adds subtle elegance, perfect for any bathroom interior. 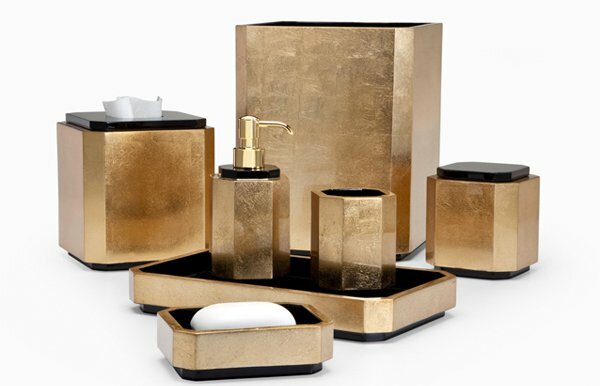 A contrast of rich gold leaf finish and black wood interior makes this bathroom accessory very eye-catching and dripping with glamour. 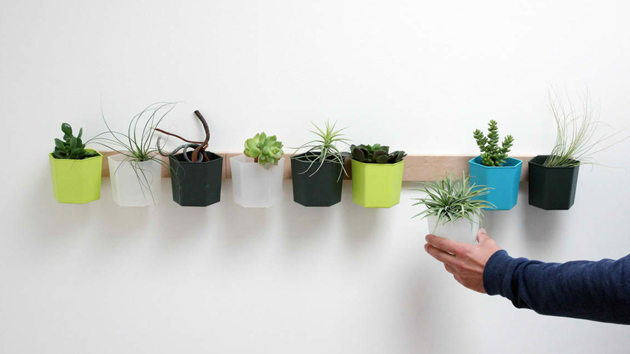 The durable lacquer seals the finish and adds irresistible shine. 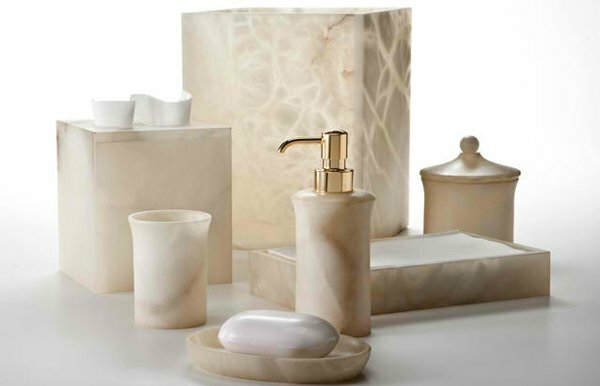 This simple yet nicely crafted and polished marble bath accessory set is made from centuries-old metamorphic limestone and the light mocha color with highlights of golden tan is natural that adds glamour and elegance. 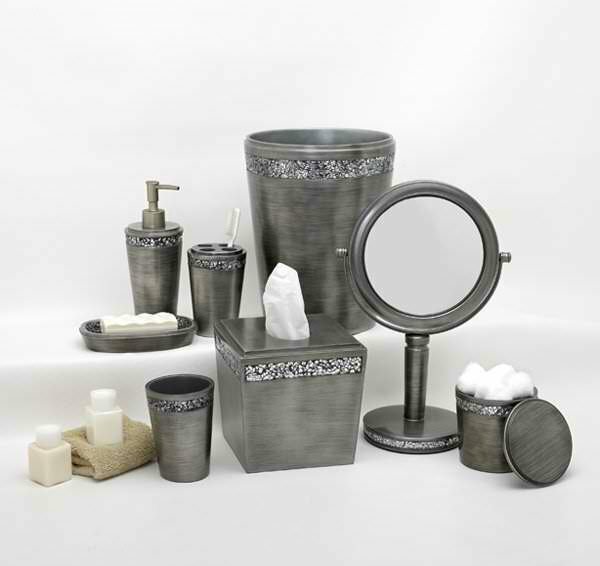 This woven stainless steel metal design bathroom accessory set adds subtle glamour to any bathroom interior, simple, elegant and luxurious. 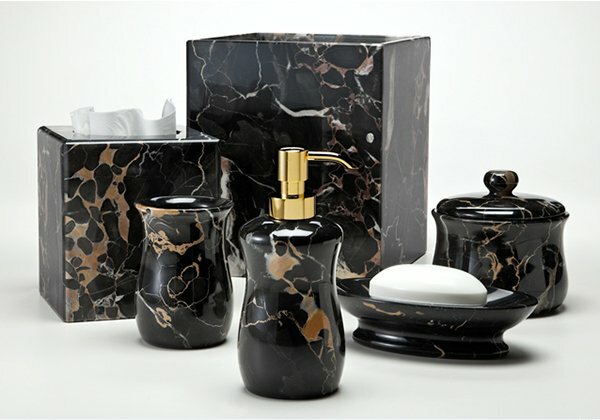 A dense jet black stone marbled accessory set with shades of golden tan and ivory is made from Italy and would surely give your bathroom a luxurious look. Luxury could also be found even from the smallest and most useful everyday accessory, even in the bathroom where we spend a lot of time relaxing and thinking during long showers. Even bathroom accessory needs a bit of glamour to add beauty to our surroundings. We can also easily replace them in case they get broken or when we feel like it, so it’s not a hassle on your part. But, if you prefer a cheaper alternative and a different kind of inspiration, we also have purple bathroom set that adds spice to your bathroom interior too.